You take a few days off from the garden and all of a sudden it becomes a battle ground between you and the various insect pests that invade....I noted that there were numerous holes in my once perfect broccoli, cauliflower and cabbage plants. I also saw a number of velvety green worms camouflaged within the foliage with the only telltale sign of them being there were the holes in the leaves and an abundance of frass (insect excrement) they leave behind. These are relatively easy pests to control though. Generally, in a normal size garden, they can be handpicked and crushed. They most commonly feed along the mid-vein and then as they grow, they tend to feed further out and may even bore into a head of cabbage. If hand picking isn’t possible or for those that are squeamish, the best treatment is Spinosad, and insecticidal soap for newly hatched larva or an application of BT (bacillus thuringiensis kurstaki). 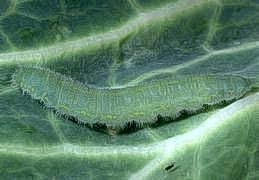 BT is a bacteria that can invade the larva and kill them without harming other beneficial insects. It is pretty interesting how BT works. Once the bacteria is ingested, there is a toxic protein crystal produced by the bacteria that is responsible for the insecticidal effect. It is released in the gut of the insects that causes them to stop feeding immediately with death occurring within a few days. BT works best on just hatched up to 1st or 2nd instars larva but since there are overlapping generations, it is good to treat regularly with a freshly prepared batch of the BT since it doesn't last long once mixed.